Why mainstream media pundits keep punting. This Week with George Stephanopoulos. The thing that most frustrates me about political speech as a form of marketing—and that’s what most mainstream media Sunday talk shows are, marketing to corporate management—is that it’s always slamming the door on its own logic. Hosts discuss controversial subjects, of course, but they’ll only go so far. This strikes me as, at best, ineffective marketing. It makes me want to see what’s behind the curtain, rather than take the hint that this is as far as polite discussion is to be taken among right-thinking people. Last Sunday was no exception. 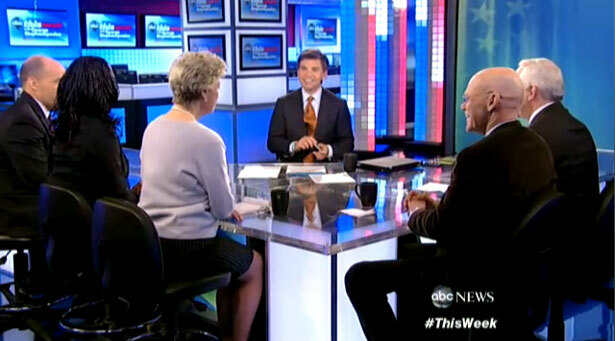 First, on This Week with George Stephanopoulos. The panelists were weighing in on the gay marriage cases the Supreme Court will hear later this month. Even conservative guests Paul Gigot and Mia Love seemed to approve of the Obama administration, prominent businesses and some 130 (and mostly out-of-office) Republicans filing briefs supporting the repeal of California’s Proposition 8, which bans gay marriage. The march of history is already moving and Republicans know if they stand in the way on this, this is just like civil rights, women’s rights…. History is now moving. This issue is done. Republicans have to come face to face with the idea, this issue is over. Wait, did he just say that Republicans have to face the idea that the issue of gay rights—like civil rights and women’s rights—is over? Did he just tell us that Republicans know they can’t stand in the way of “the march of history”? Dowd may believe that, or maybe in his enthusiasm he overstated it. But why didn’t Stephanopoulos use that moment to, um, at least mention that last week the Supreme Court heard arguments to overturn Section 5 of the 1965 Voting Rights Act and that Justice Scalia complained that protecting this civil right represents the “perpetuation of racial entitlement”—which pretty much add up to the definition of reversing the march of history. (Meanwhile, the GOP is busy harassing other marchers by closing down women’s health clinics and waving around trans-vaginal probes like nightsticks.) I shouted at the TV, “Why isn’t anyone talking about that!” But George didn’t hear me and moved on to CPAC’s snub of Chris Christie. SPEAKER JOHN BOEHNER: Well, David that’s just nonsense. If he had a plan, why wouldn’t Senate Democrats go ahead and pass it? Gregory pivoted to tax revenues at that point, missing the very obvious response:  Senate Democrats did vote for a plan. But Senate Republicans filibustered it. Just as they’ve filibustered every major piece of legislation that’s come down the pike over the past four years. So close, Mr. Gregory, so close. UP with Chris Hayes and Melissa Harris-Perry are different from these shows not only because they’re lefty, but because they wouldn’t let something like that slip. They try to pursue ideas to their logical conclusions, in order to lay bare the basic political choices each issue poses. When Gloriosus calls out to them, “There’s none of the enemy left, right?” the soldiers start chanting, “Right, right, right…” And walk into a wall. Meanwhile, in the alternate reality of right-wing talk shows, Sean Hannity got a boost from Bob Woodward—or is he just playing to Woodward’s agenda?